The Dordogne is noted for its welcome to visitors. We will be delighted to ensure that you have an enjoyable holiday at la Grande Veyiere and experience the many splendours of this marvellous region; its historic riches, its gastronomy, its countrywalks and unsploit countryside.Our campsite is situated in the peaceful countryside and has a convivial family atmosphere ,and compact layout with 40 camping emplacements and 20 mobile homes set out in about 11 acres, each site enjoying a level and well shaded environment. The sanitary complex has individual shower and wc cubicles and two baby care bathrooms. The reception wing has a small shop with fresh bread each morning, a bar with take away snacks, 2 spacious terraces with large barbecue. The swimming pool 150m° is in the form of a lagoon, in a gently sloping and sunny situation; a fully equipped playground and numerous landscaped areas complete our campsite. Ideal for a 4 to 5 person family. Wooden terrace 10m², garden table and chairs with parasol. Room 1: 1 double bed. Room 2: 2 twin beds or 1 single bed that may be converted into a double bed + child's bed in mezzanine (not for children under 6 years old). It is possible to add a baby cot in some models: please advise when reserving. Dining area can be converted into an additional double bed. Pillows, 1 quilt 220x240, 2 quilts 140x200 and 3 summer blankets. Kitchenette: refrigerator, gas cooker, coffee maker, microwave and crockery for 6. Think of bringing or rent: sheets, pillowcases, towels, etc. A high chair or baby cot may be available for hire at an extra charge. Our pitches for tents, caravans and camping-cars are arranged in well shaded rows, each with an average surface area of 100m². Most have an electrical terminal close by, however we also recommend that you bring your own long extension cord. If you are planning a stay in July or August, booking a pitch in advance might be a good idea. Whilst we cannot guarantee provision of a specific pitch, wherever possible, we do our best to meet any stated preference. For the periods of stay out of season: attention, reduced services. 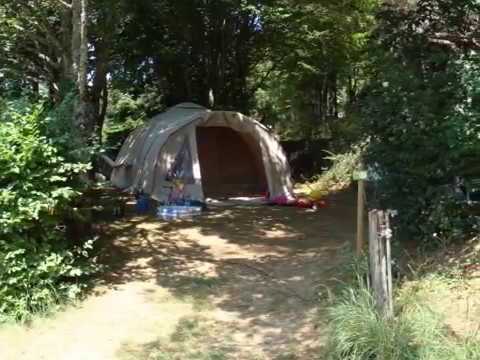 Large, equipped lodge tent 20m², ideal for a family of 4 to 5 persons. Covered terrace 12m² with garden table and chairs. For more comfort, these tents are mounted on poles. Room 1: 1 double bed, 140x190cm. Room 2: 1 bunk bed, 80x190cm, (the raised bed is not suitable for children under the age of 6). An additional single bed or baby bed can be supplied if requested when booking. Think of bringing: sheets, pillowcases, towels, etc. A high chair or baby bed may be available for hire at an extra charge. 100% Canvas Cotton Sahara tents, also called Sibley or Bell. Tents constructed of cotton canvas do not only create a warm and romantic vibe, cotton is also known to be a fire retardant, breathing natural material. Since cotton shrinks when it gets wet, your tent will be completely waterproof even in heavy rain. Moreover, due to its breathing quality, cotton tents never feel damp or moist inside, contrary to its nylon or polyester counterparts. Each tent has three separate bedrooms, equipped with screens. Room 1: 1 double bed, 140x190cm. Room 2 and 3: 1 bed, 80x190cm. A baby bed can be supplied if requested when booking. Pillows, 1 quilt 220x240, 2 quilts 140x200 and 3 summer blankets. Large indoor living room (4m x 2m). Kitchenette on a partially covered terrace. Refrigerator, gas cooker, coffee maker, microwave and crockery for 4. Large, equipped lodge tent 20m², ideal for a family of 4 to 5 persons WITH BATHROOM. The plus of our Sahara-tents Duo for 2 persons: lots of space inside and free choice of arrival and departure days. Minimum stay: 3 nights. 100% Canvas Cotton Sahara tents (also called Sibley or Bell). Tents constructed of cotton canvas do not only create a warm and romantic vibe, cotton is also known to be a fire retardant, breathing natural material. Since cotton shrinks when it gets wet, your tent will be completely waterproof even in heavy rain. Moreover, due to its breathing quality, cotton tents never feel damp or moist inside, contrary to its nylon or polyester counterparts. Each tent has a separate bedroom, equipped with screens, 1 double bed (140x190cm), 2 pillows, 1 quilt 220x240 and 1 summer blanket. Large indoor living room (4m x 4m). Kitchenette on a partially covered terrace. Garden table and chairs. Refrigerator, gas cooker, coffee maker, microwave and crockery for 2. Relaxed, quiet family friendly holiday. Large, shady pitch looking out over woods. Lovely friendly well run camp site. Staff were very helpful, facilities were good and toilets had seats. The place was well kept and clean with a lovely pool. The pitches were well placed with lots of access to shade which was needed during the hot summer. We enjoyed being in the forest away from the main tourist areas but could still venture out if we chose. Can't praise this place highly enough. Beautiful location, impeccably maintained, all the facilities you could wish for but in no way overcrowded / still a real feeling of being in nature, not too noisy but still plenty of other families with kids to play with, and attentive and thoughtful management. The only suggestion I'd have would be to provide a couple more rubbish bins in the mobile home, to enable easier rubbish-sorting! The mobile home was exactly what we needed - clean, well maintained, enough space for what we required, excellent cooking facilities, and a lovely area to sit out in. Lots of insects - probably attracted by the beautifully natural surroundings! The campsite is beautiful with spacious shady pitches that are well spread out. The surroundings are beautiful. The owners are helpful and friendly and ensure that everyone is quiet from 11. The wash facilities are pretty good and were always clean. Beautiful views and felt very private. Lots of space. Totally flat. Very shaded which helped when weather was hot. The pitches are all cut into the hillside which was scenic. A beautiful and peaceful site, with large pitches and plenty of open spaces around. Very friendly, a nice bar and outside sitting areas, and a reasonable selection of take away food. Very clean. Lovely swimming pool. Beautiful area. Large pitch, nice and shaded. Smallish, friendly and wonderfully peaceful. Lovely owners, friendly and always happy to help wherever they can. One of the best campsites we've ever stayed at! Lovely, welcoming and helpful owners, huge pitches, great swimming pool for the kids. Very family friendly whilst also remaining relaxing and peaceful. We especially enjoyed the craft activities, paella and music nights. Very sad to leave! We will definitely be back! Beautifully maintained. Big, private pitches. Wonderful location.